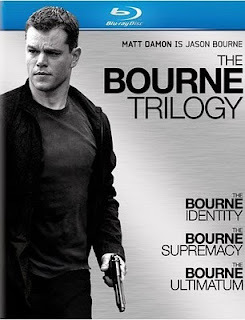 The Bourne Trilogy blu-ray collection features all three of the Bourne movies ~~ The Bourne Identity, The Bourne Supremacy and The Bourne Ultimatum. "It's hard to imagine a better trilogy of films more suitable for Blu Ray than the Jason Bourne movies. Each film looks absolutely fantastic, the sound is spot on, and the films themselves are masterpieces by thriller standards. Bourne has become iconic; the Bond of the new generation. Matt Damon's all-american good looks, intensity, and acting skills give the films a credibility that many movies search for but never find. There are so many reasons to buy this collection. The transfer quality is nearly perfect in my opinion, but I am not the type to watch the films with a magnifying glass and look for any tiny mistakes. The surround sound is simply unreal. John Powell's score really comes to life and the depth of the sound effects are fantastic. The scene in Ultimatum that takes place in Waterloo Train Station is epic and should go down in cinema history as one of the best cat-and-mouse chase scenes ever made. The storyline is well constructed, believable, and leaves you hungry for more. Thankfully, there is a fourth Bourne movie in the works, with both Damon and director Paul Greengrass returning to make sure it is done right. I can't wait. There are few movies I will watch again and again, and these make that very short list. The best trilogy since the GODFATHER movies (sorry STAR WARS fans), these are a no brainer for any movie fan. 5/5 stars." This is, however, a case where you need to compare the price. Today the blu-ray trilogy is retailing for $65.99 on Amazon. Down from $119.98, this represents a $53.99 saving from the suggested list price. However, each of the movies can be had individually for $19.99, making them a better deal individually at $59.97 for all three. Given the pricing, I'd buy them individually and then be prepared to sit down and enjoy! Read about a few more great blu-ray movie collections at my new page, Build Your Blu-ray Collection Quickly With A Blu-ray Movie Box Set. Prices change regularly on Amazon so always do the comparison shopping before placing your order!